Pulled thread embroidery, also known as drawn fabric, is a form of whitework that does not involve cutting the fabric threads. Instead tension is used when working the stitches to draw the fabric threads together to produce a lacy effect. Because of the tension required, stranded embroidery floss is not the ideal thread to use as it can break; pearl cotton or crochet cotton are more suited. If you don't have any suitable thread, you can always use the fabric itself! Just unravel threads from the edge of a spare piece of fabric (don't use the project piece or it may not be big enough when you are finished) and stitch with them. Of course the thickness of thread and the colour will match exactly! 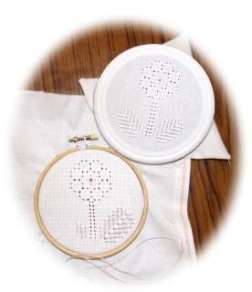 Try to use a loosely woven embroidery fabric for pulled thread embroidery rather than a close weave. The patterns will show up better. Historical pieces were sometimes worked on 50 count fabric but it is more common to use 28-36 count nowadays. Working in an embroidery hoop or frame is recommended to help keep the un-stitched fabric threads lined up at right angles and clearly visible for counting. DO NOT stretch the fabric too tightly in the hoop, however. Starting and finishing your threads needs to be done with care as stray threads can show behind the openwork areas. One way to avoid this is by using the hoop to trap the beginning of the thread so it can't accidentally be pulled out of the fabric when starting the stitching. To fasten off, release this thread later and carefully pass it through the solid areas where the threads have been pulled together on the back of the work. 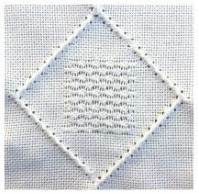 A variety of stitches are used in pulled work embroidery, some with tension, some without. Composite stitches are built using two or more stitches, creating very pretty patterns. It is fun to use your imagination and creativity and discover pulled thread embroidery stitches that work well together.